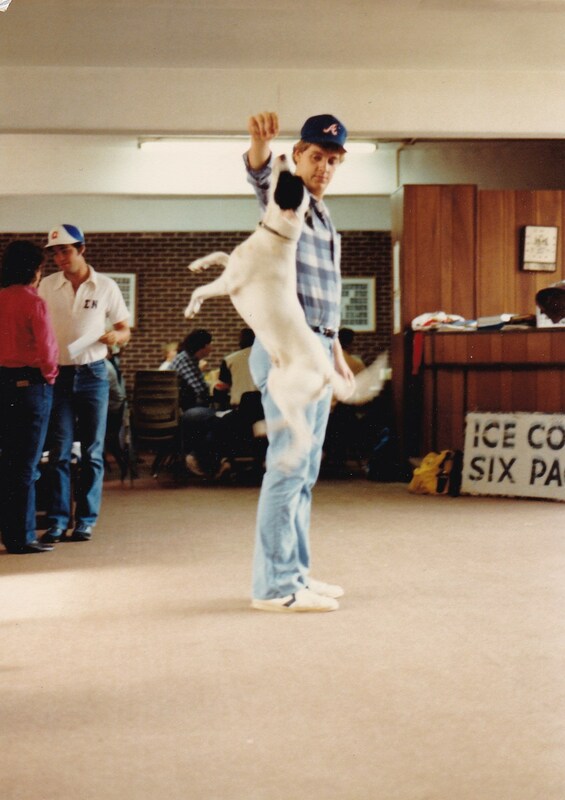 Rollo jumping for a treat held by Derek Nowatzki at Sigma Nu in the early '80s. Some Sigma Nu stories pull at the heartstrings, and this one told by Mark Smith (GA #1505) certainly makes the strongest of us a little sentimental. He writes, “This story proves that brotherhood lasts a long time. It starts around Thanksgiving of 1980, when Lou Matrisciano and Greg Tye came back to the house with a cardboard box full of six puppies they had found abandoned on the side of the interstate. We took them in, took care of them, and eventually gave them all away except for one who we kept as the house dog. We named him Rollo. He was a little black and white mutt, but a great dog. We never had to open a door to let him in or out... he jumped through a window instead. 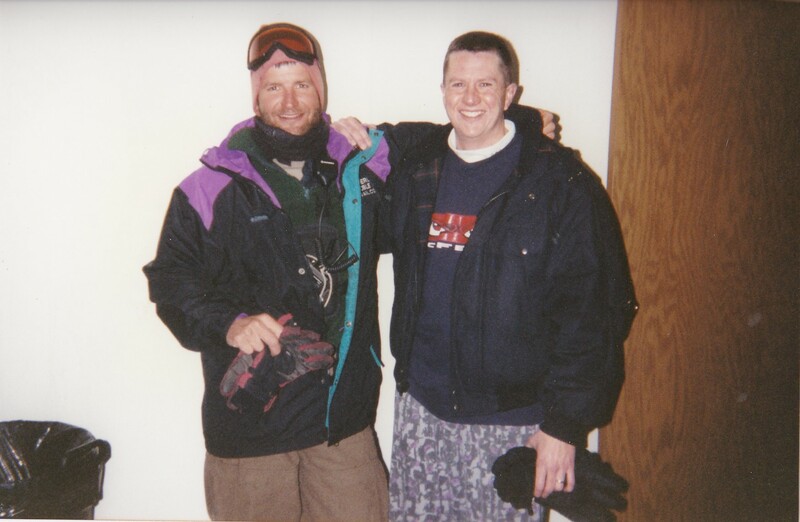 Mark Smith and Greg Davidson, reunited after a decade in Vail, Colorado. The tradition was that a senior kept him in his room at night, and when you graduated, you 'gave' Rollo to someone else. My roommate Chris Troutman and I had him in the fall of '82, and when we graduated we gave him to Greg Davidson. That was the last I had thought of Rollo...until February of 1994. That’s right, Rollo! When Greg graduated there was nobody who wanted him, so Greg adopted Rollo and traveled with him around the country. Greg said he was moving slowly, but still himself, and even showed us a picture of the little guy. Greg was a great guide, and even though I have no idea where he is now, I know that Rollo was loved and cared for. This story is just to let all the recent alums and current brothers know that they should never take anything for granted, and never overlook even the little moments.